Gluefast DUOS are pressure sensitive spots of glue about the size of a dime (1/2" diameter). 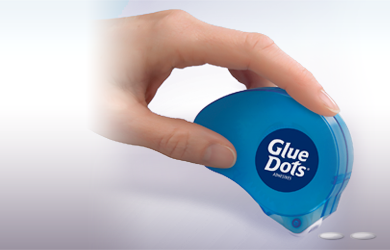 Often referred to as fugitive glue or booger glue, Gluefast DUOS are similar to Glue Dots® except that the adhesive formulation is slightly different and the silicone release liner is two inches wide with two dots instead of one. 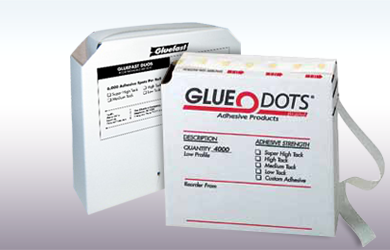 Compared to Glue Dots®, Gluefast DUOS are a cost-effective alternative with about a 15% cost savings to the end user. 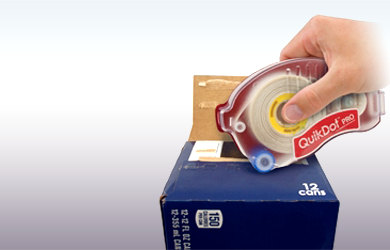 A cost-effective pressure sensitive adhesive alternative, Gluefast DUOS are adhesive dots that come not only in self dispensing boxes of 1000 or 6000 but also in boxes of 75 flat sheets with 80 dots per sheet. Rolls of Gluefast DUOS are extruded onto a two-inch wide silicone release liner with an alternating pattern of pressure sensitive adhesive dots. Gluefast DUOS are available in low tack, medium tack, high tack, and super high tack, Gluefast DUOS. For an Adobe Acrobat PDF file describing the DUOMATE click here! 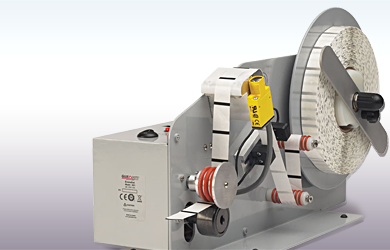 Also available is Gluefast's DUOMATE which automatically or manually cuts continuous lines of DUOS in lengths up to 99 inches. 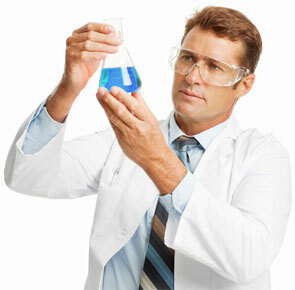 Read on for more information on the Gluefast DUOMATE. 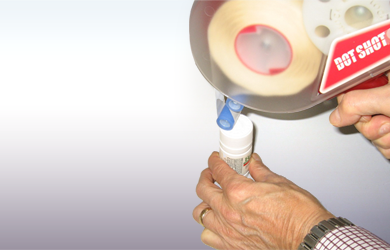 To feed, measure, and cut lengths of Gluefast DUOS spots or continuous lines, use adhesive dispensing equipment such as the Gluefast DUOMATE. 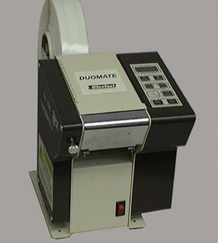 Simply place the roll of DUOS behind the machine and feed into the DUOMATE. Whether your using standard DUO spots or a continuous line of glue, the DUOMATE features extreme accuracy with lengths set in .05" increments (1mm when set for metric calibration) from 1" to 99" and adjustable speed from 1 inch per second to 5 inches per second. Additionally, when the DUOMATE is turned off, all settings are retained for future use.